-I'm going to kill you. -Yeah, right, seeya rafter, lads. "You're nothing to John B. Keane, no? This week the Blackrock Crew go to lunch. Cool. TOP: Martin, Viv, Mark, Dremot. BOTTOM LEFT: Alan, Phil, Martin. BOTTOM RIGHT: (Front to back) Glen, Viv, John, Dermot, Fergus, Martin. This week our company, the Business House was told that we would have to move from our most agreeable venue in Blackrock to the Development HQ in Clonskeagh. This is wrecking me buzz! Firstly, there are no shops near the new building. We will have to go into town on a Saturday or Thursday night to get some groceries, books or records. Secondly, we can't even go out to lunch. I believe there is one foreign restaurant in the vicinity, and although it is allegedly quite nice, I wouldn't say it's nice after eating the same thing for a month or two. And getting to Clonskeagh using public transport is a killer. There are very few busses and some you have to walk to Donnybrook to get them. And what happens to our getting a pizza delivered? That is probably not allowed any more. Who's to know what else we are not allowed? Possibly no more free drinking sessions! Within the new environment, our identity will be blurred, we will possibly be alienated by the IT House employees. This has put me in a real bad buzz. If you are not involved, then imagine you are working in a land where there is restaurants, pubs and shops apleanty. Every now and again there is a free drinking session, sometimes with an event to match it. Everyone is in harmony and it is happy days. We are bordering on holding hands and singing songs in the car-park. Then one day this evil multinational comes ion and says I'll have this company... IN CLONSKEAGH! Everyone anticipates the bleak corporate sanitised version of a once-perfect world and log onto Topjobs.net. The world as we know it is gone, gone, gone. Now that wrecks me buzz. This is an extension of the party photographs that I had before, but now I have taken to carrying a camera with me all the time, so anything I photograph is likely to end up here. 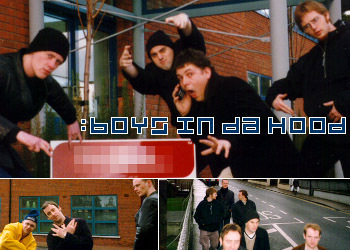 This week I have pictures of the Blackrock massive chillin' with their new sign. Every week I will chose a really cool site and link to it here with a bit of background info and some opion of it. If you have a site or know a deadly site, then send me the url and some background info if you have any, and it I think it is good enough I will post the details here for all to see. I have me spies on the streets scoping for the latest words and expressions. Each week the latest and greatest one will be here with an example of how to use it in regular speech. Whenever I have an issue or something is upsetting me, I will post it here for your amusement. There will be a poll that you can vote to see how much it wrecks the buzz of you, the Waltzer massive. That's coming soon. Everything that is put on the site will now be filed away and you can view or search the database. That is also coming soon. Recognize: I is here with none other than me main man, Phil Barrett, and we is bangin' on about his new website. It is called JINX. So, Phil, what is your site about? -Well it's about meself. I have some of my artwork up on it. -Don't you think that that is being, like, a bit selfish. -Naw, I don't think so. I think people can come along and enjoy the site for what it is. -Can I go to your site an buy some slippers for me Nan? -I'm afraid not. But sure I could put a link on it sometime if there is a demand for slippers in the future. -Aye. So Phil, big up to ya, respect, and thank you for showing us that we need to know about Jinx, but not if we is looking for slippers. Keep it real.